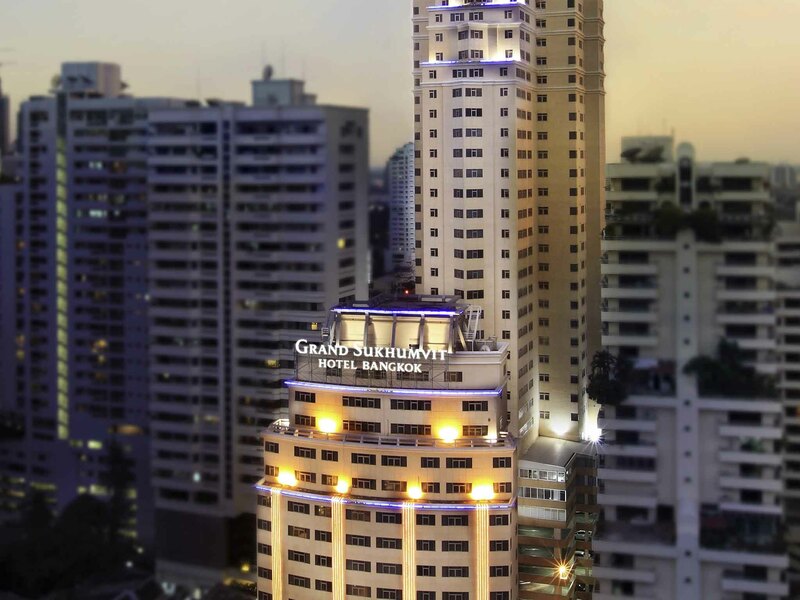 Grand Sukhumvit Hotel is a true upscale International 5-star hotel situated in Bangkok. 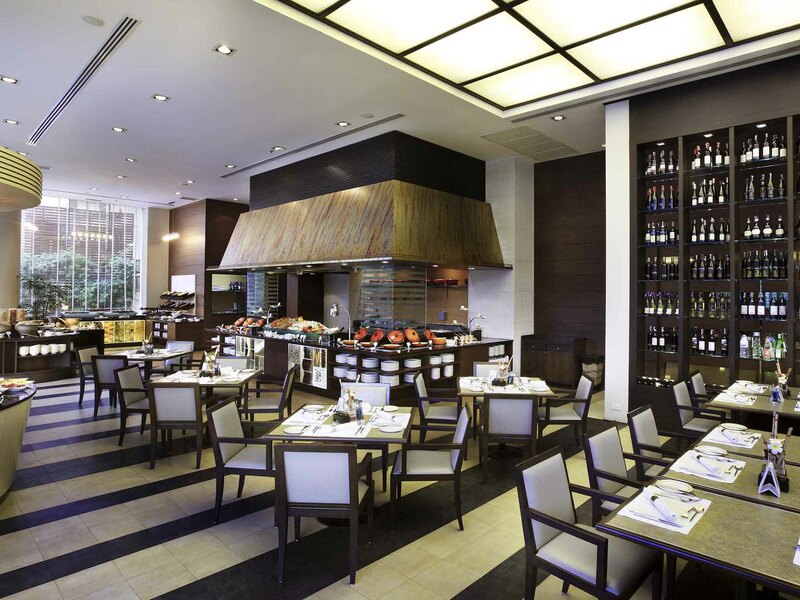 This famous Bangkok city hotel is managed by Accor. Sukhumvit Road is the commercial hub of Bangkok where many International brand hotels, shopping malls, and nightlife is lined on either side. 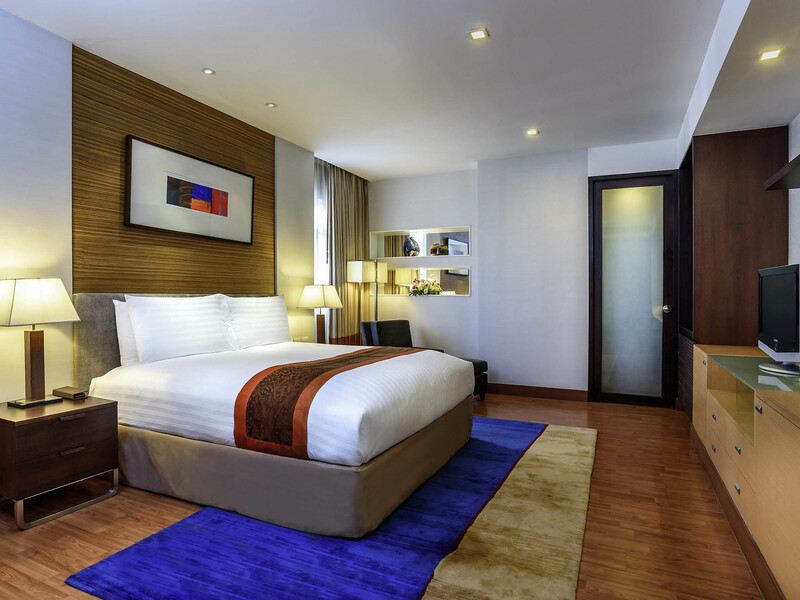 The vibrant location of the Grand Sukhumvit Hotel makes it special as major businesses, entertainment facilities and shopping centers are right next to each other. The hotel is a great retreat for honeymooners and couples. Many renowned shopping complexes including Terminal 21, Siam Paragon, Central World, MBK Centre, and Bumrungrad International Hospital are easily accessible through the BTS sky train Network. 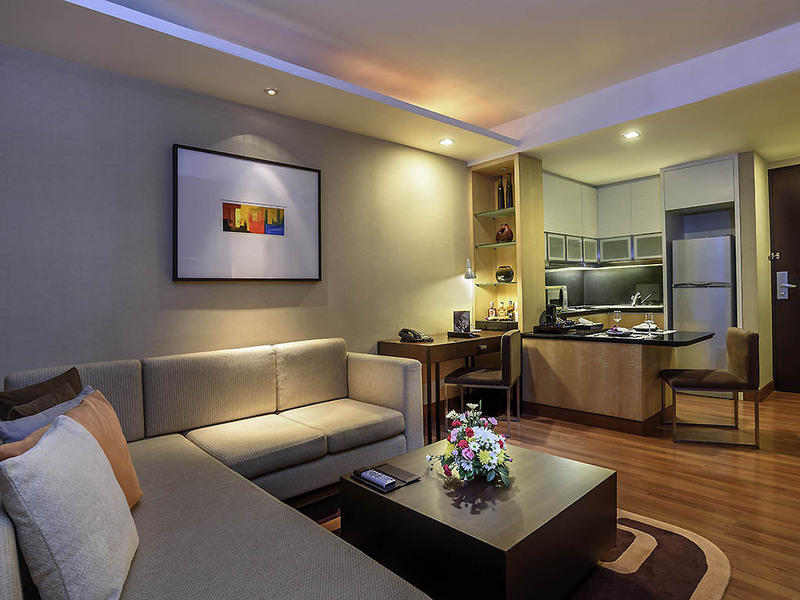 Grand Sukhumvit Hotel Bangkok offers a luxurious stay with an essence friendly residential ambiance in Bangkok, Thailand. 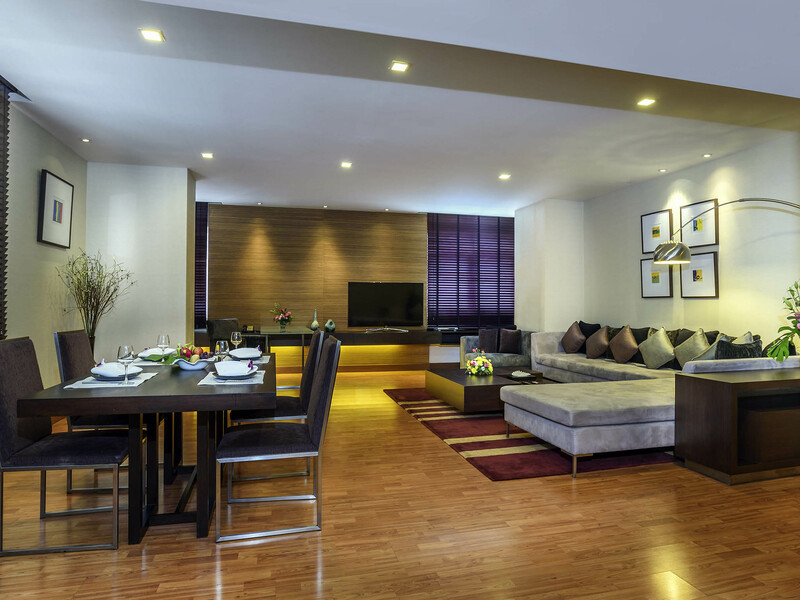 The Grand Sukhumvit Hotel offers their guests with the following types of well-furnished accommodation. The studio-styled Deluxe Room is equipped with a king-sized bed, TV, free Wi-Fi, microwave, a stylish bathroom with rain shower and bathtub. The Deluxe Twin Bed Room offers an exclusive spacious uniquely designed interior a king-sized bed, TV, free Wi-Fi, microwave, a stylish bathroom with rain shower and bathtub. The Deluxe Suites features with a full kitchen, dining table and a separate living area, modern bathroom equipped with separate bath and shower facilities for guests. 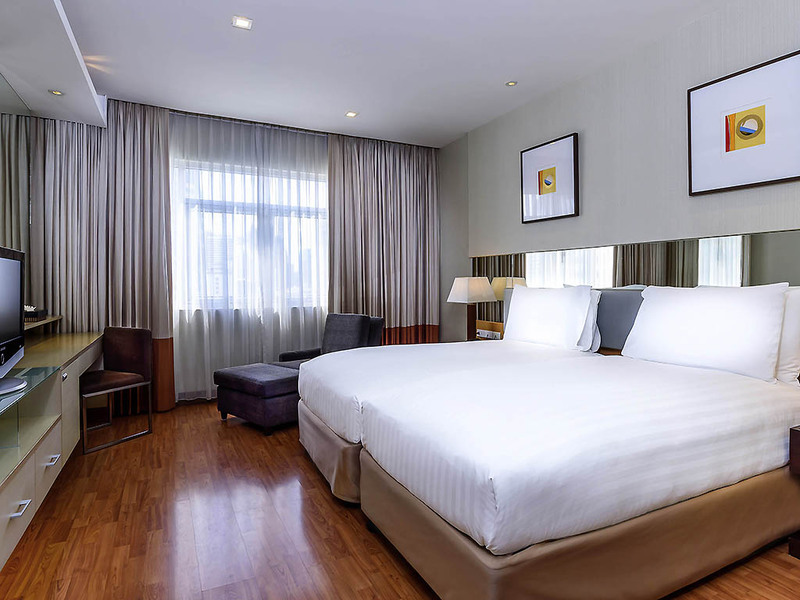 The most attractive stay at the Grand Sukhumvit Hotel is the Apartment that offers a full kitchen, incredibly spacious dining and living area, laundry facilities, and Jacuzzi in master bedroom. 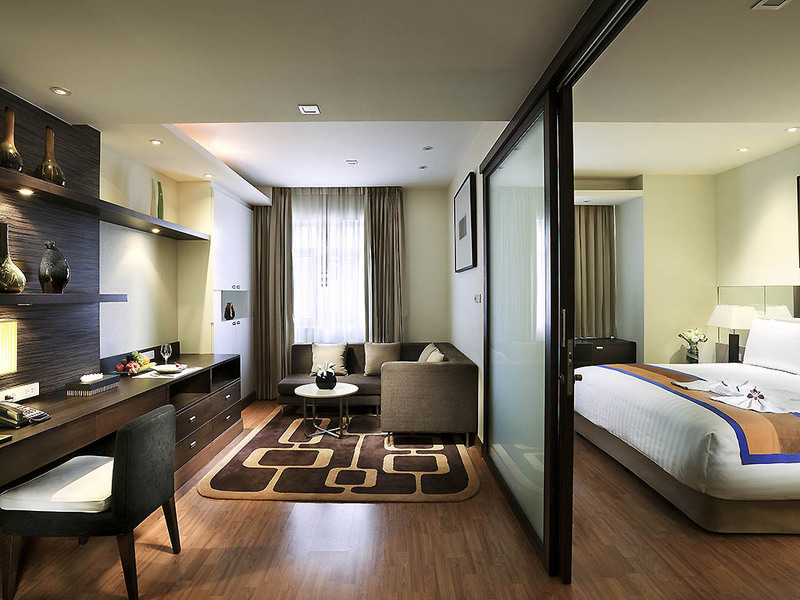 Grand Sukhumvit Hotel, Bangkok is a great destination for all types of guests ranging from tourists to business persons. The hotel welcomes their guests with a wide range of luxurious modern amenities. This property is also an ideal venue for a commercial meeting in Sukhumvit. Whether it is about business meetings, presentations, seminars, conferences, gala receptions or weddings, the hotel is ready with a series of six spacious and technology equipped rooms. 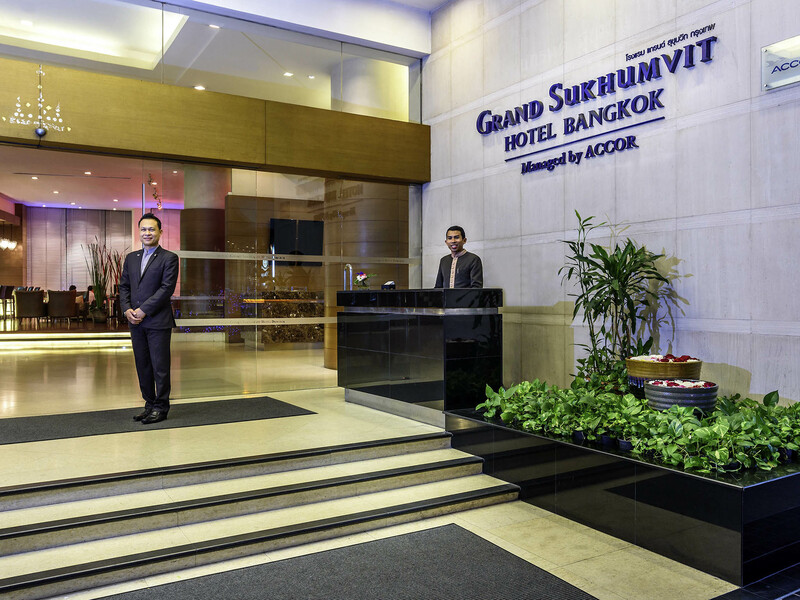 The Grand Sukhumvit acquires a highly experienced team of event planners who ensure the smooth and successful running of all types of events and thus every time to make this Sukhumvit Hotel as the best choice for a meeting in Sukhumvit. 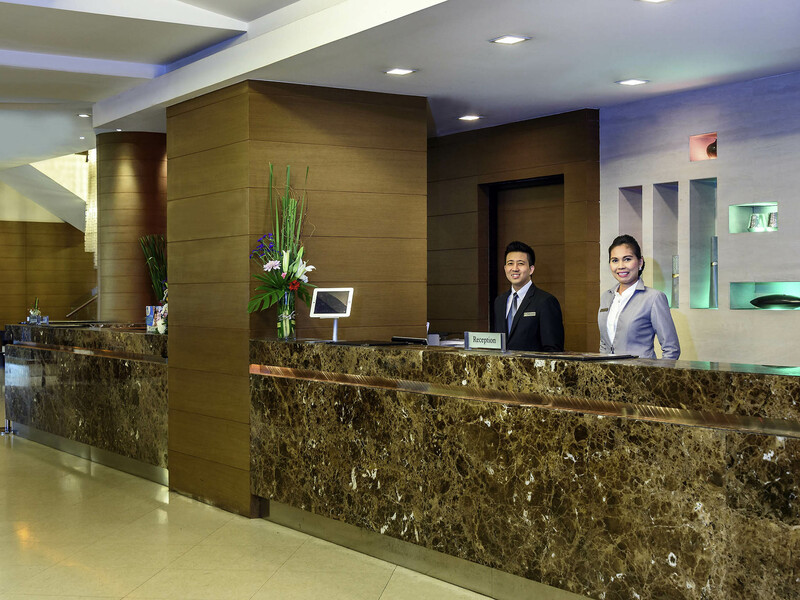 The hotel has an excellent and efficient service providing staff members always ready to serve their guests. At Grand Sukhumvit Hotel, one is bound to be confused at what to choose as there is an extensive array of foods and beverages offered by exclusive restaurants situated within the hotel. 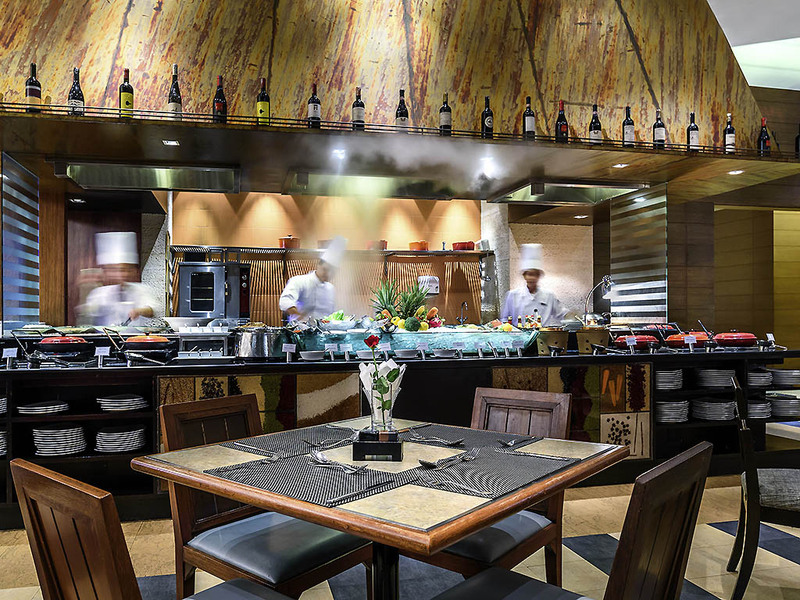 The hotel also serves Bangkok Buffet Promotion throughout the year. Cafe De Nimes Restaurant, Bonbon Delicatessen, Petrus Lobby Barand Aziza Poolside Bar are the four exclusive restaurants that serve delicious cuisine for their customers. If one wishes to enjoy a great value lunch Buffet, some homemade cakes, and pastries or a long cool drink in funky surroundings, then one would have no choice other than visiting these marvelous restaurants. 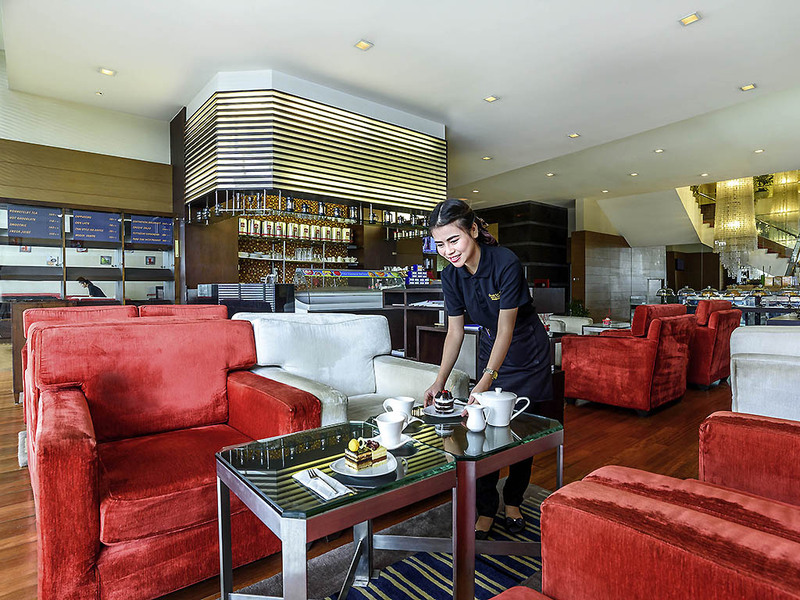 The experience at the Grand Sukhumvit Hotel is truly mind-blowing. Guests will surely be rejuvenated and relaxed after having a long and exhausting day. Guests will enjoy a great time enveloped in an excellent location, very courteous and efficient staff, spacious room that the hotel offers for their customers. 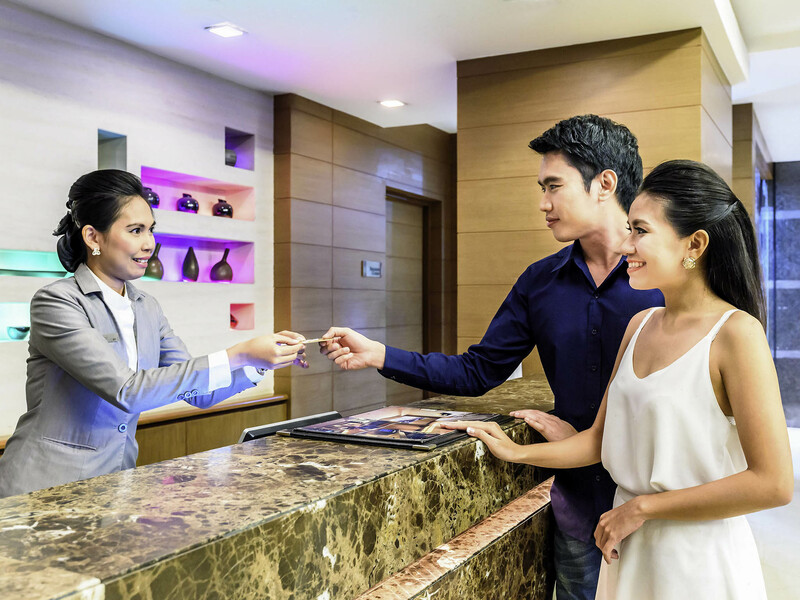 How far is the Grand Sukhumvit Hotel located from the International Airport? The distance between Suvarnabhumi Airport (BKK) and Grand Sukhumvit Hotel Bangkok is approximately 22 km. Does the hotel provide a pickup service from the airport? Grand Sukhumvit Hotel Bangkok provides a 24-hour shuttle service for all type of tours- whether it is leisure or a business tour. The hotels airport shuttles offer direct service from Suvarnabhumi International Airport and Don Muang Airport to the hotel with an approximate time of 30 40 minutes. What are the languages spoken at the hotel? The hotel crew members are fluent in Chinese, Thai, Japanese, Arabic and English. Does the hotel allow pets inside? No, the hotel does not allow any pets inside the premises. What are the special offers that guests can avail? The hotel delivers a variety of delicious and healthy lunch box, created by the efficient culinary team at the doorstep. One can choose from the hotels menu card, varied from International, Thai, and Indian. On the ground floor of the hotel, the tempting Seafood Buffet Dinner is served at Cafe de Nimes with all mouth-watering menus of Seafood Festival, which is available every day from 6.30 10.00 pm.